Decorating your bathroom can be fun, but it can really add up when it comes to cost. Once you replace all of the different things in your bathroom, from your outlets and faucets to your accessories, you can spend a pretty penny. If you are looking for a vintage look, consider getting a vintage bathroom accessory set to give your bathroom that added flair without spending too terribly much. We looked at some of the best vintage bathroom accessories sets out there, and our favorite was the Miss Bella 5 Piece Ceramic Red Rose set. It is not only stylish but also has that vintage flair. We also found a few others you may like. Searching for vintage accessories to match your bathroom décor? As you shop around, there are some things to consider. First, consider the look that you want. If you want something vintage, consider what period you want it to be from. Are you looking for a certain color scheme? Keep these things in mind. If these vintage accessories aren’t exactly what you were looking for you may also want to check out our list of luxury bathroom accessory sets, while they have a similar look and feel to these vintage ones they may give provide and an extra touch of elegance you are looking for. Another thing to consider is the items that come in the set. What do you use most in your bathroom? Look for items such as a toothbrush holder, soap dispenser, bar soap dish, cups and other items that you use frequently. The more items, the more versatility you will have in decorating your bathroom. 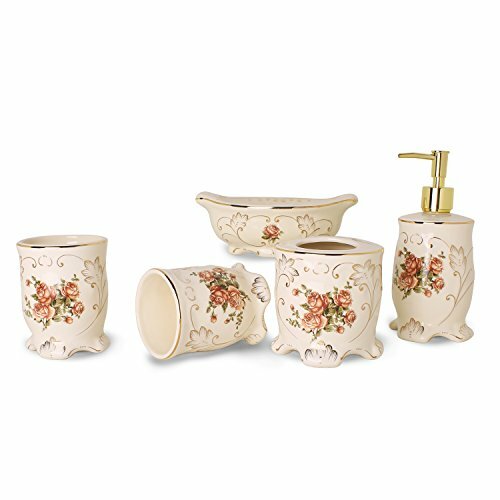 Some sets also have individual items that can be added to round out the look of your bathroom, some even include matching bathroom trash cans or tissue holders. You should also think about the type of material that the set is made of. Plastic usually does not hold up as well and tends to get dirty quickly. Ceramic is a great material to go with. It is not only sturdy but also pretty easy to keep clean with soap and water. Some metals may also be good, but consider the rust factor if you are thinking about metal accessories. 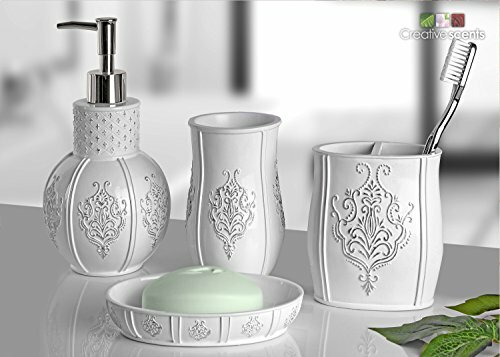 First up, we have the Vintage White Bathroom Accessories by Creative Scents. This is a great choice for those that want that classic white theme in their bathroom. It has a vintage style but is still classic and clean. The set is decorative enough without being overly fussy although some people may not be looking the embossed look of the decorative accent. One of the advantages of this set is that the maker, Creative Scents, offers a wide variety of additional pieces that can be added to this basic set. They even have a matching wastebasket and toilet brush set. It has a decorative Fleur De Lis motif on each piece. The Fleur De Lis is known for being a great vintage symbol, especially in the south. It is a complete set, with the soap dispenser, a holder for your toothbrush, a tumbler, and a dish for holding your bar soaps. The finish is glossy, which means that it is pretty easy to clean. Unlike a matte finish, this is not something that will be hard for you to keep looking fresh and clean. The plastic pump on the soap dispenser may actually be a bit difficult to keep clean and free-flowing. It tends to clog easily. The toothbrush holder is a bit on the smaller side, so it may not be ideal for holding your toothbrush AND a large tube of toothpaste. Next up, we have our favorite. The Miss Bella 5 piece accessory set is really a great choice if you like the floral vintage look. It is elegant, yet stylish, and offers just about everything that you could possibly need for organizing your bathroom counter. The look is a throwback to early times with an elegant rose motif. The set includes a liquid soap dispenser, soap dish, toothbrush holder and two matching tumblers. The drawbacks on this set are that they are very feminine, so it may not be a huge hit with the men in the house…compared to say a less fussy vintage white set. The set is made up of durable ceramic, but this also makes it a bit fragile, so be careful with it. Ceramic, however, is really durable and easy to keep clean. 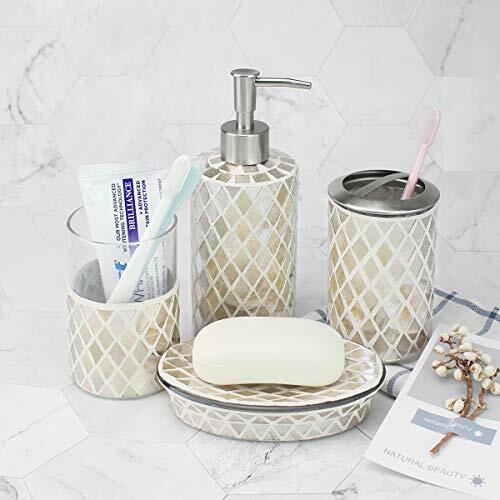 Complete five piece set gives you everything that you need, including a soap dispenser, soap dish, a holder for your toothbrush, and two different tumblers. The pieces are actually larger than they look, so you don’t have to worry about whether size will be an issue. These accessories cannot be put in the dishwasher. You must hand wash and dry them to keep them clean. This is just because the dishwasher can chip the paint on the ceramic. Ceramic items are fragile, so if you drop it then it could break pretty easily. Just be careful with it, so that you don’t break any of the included accessories. Finally, we have the Victoria Bath Ensemble set. This is another set by Creative Scents. It also has a vintage style, with a cream colored design that is sure to match your vintage bathroom. Let’s take a look at everything that this accessory set has to offer. Does it look like something that would fit your bathroom décor? Set is complete with four pieces, including a soap dispenser, toothbrush container, soap tray, and a tumbler. All of the pieces go together great. Each piece has a non-slip grip on the bottom, so that means it won’t slip around on your bathroom counter. The accessories are made with quality as a priority. They are crafted wonderfully and have the ability to be used outside of the bathroom as well. The compartments in the toothbrush holder are pretty small. It does not fit your toothpaste tube along with it, so this is something to keep in mind. Some consumers said that the soap dispenser lid does not always screw on as tight as it should. This can lead to spillage if you are not careful. If you are still on the hunt for the best items to complete your rustic or contemporary bathroom, then you’re in luck. Here’s a six-piece bathroom accessory set you must get now. The package includes one soap dish, one lotion or liquid soap pump dispenser, a toothbrush holder that holds a maximum of four toothbrushes, two tumblers, and one cotton swab and ball holder. Each piece was made by artisans whose specialization is a specific craft or material, and aside from durability and overall beauty, they’ve also made sure that each piece in the set is perfect for the master bathroom, guest bathroom, kids bathroom, and even for commercial purposes. It’s also worth mentioning that every piece in the set is not mass-produced. This is because the same artisans mentioned earlier use traditional production methods that ensure meticulous finishing and fine craftsmanship. Have you always wanted a bathroom that offers a great experience to anyone who enters? Then the Avanti Linens Mojave Bathroom Accessory Set is your best bet. It’s a set of nine different bathroom essentials, each piece a statement piece on its own–one that’s not just stylish, but also carefully crafted. The set has the following bathroom essentials: bath rugs, lotion pump, shower curtain, shower hooks, soap dish, tissue cover, toothbrush holder, tumbler, and wastebasket. Each of the pieces features the same intricate, beautiful, hand-crafted design that should give the bathroom a uniform appearance, and for this reason, care must be taken when it comes to maintenance. For instance, the tissue cover that’s included in the set must only be hand-washed, and only when necessary. Also, care must be exercised when ironing or washing the shower curtain lest you ruin the embroidered middle part. There’s a report of the shower curtain not being black, but rather dark navy blue. 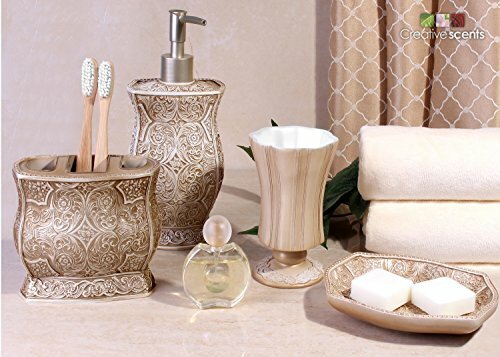 If you have always wanted to add a touch of elegance to your bathroom space, then this four-piece mosaic bathroom accessory set that includes a soap dispenser pump, tumbler, toothbrush holder, and soap dish is a must-get. Depending on the set you’ve chosen, each of the items can have either a stylish diamond or elegant flower mosaic design. It’s worth noting that these two designs won’t go out of style anytime soon, and because of this, you won’t need to worry about replacing them in time. Another thing worth noting is that regardless of what set you have selected, the design, and thus the product as a whole, can help in making space look brighter. Overall, it’s an eye-catching product that’s also practical–one that helps a lot in making your bathroom space look cleaner and more organized. 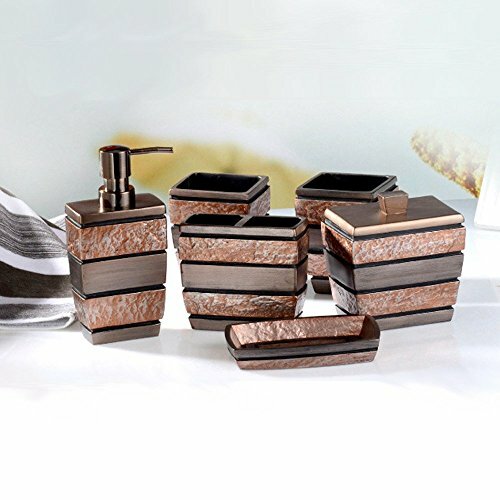 The DWELLZA Silver Mosaic Bathroom Accessories Set is a decent option for anyone looking to make their bathroom space shine. After all, it’s a six-piece silver-gray decorative bathroom accessory set that includes the following essentials: a tumbler, toothbrush and toothpaste holder, waste receptacle, tissue box cover, lotion dispenser, and bar soap dish. Aside from the standout silver color, each piece features an enchanting, eye-catching, relaxing crackled glass detailing. This feature, as well as the beautiful curves each product has, will surely evoke wows from whoever drops by your bathroom. Worried about the damaging effect of exposure to bathroom humidity? Worry not– this accessory set is fashioned from high-quality resin, a material that is known for resistance to humid bathroom conditions. In other words, this product features the shine of metal and the longevity of resin–each of the pieces of the set will stay eye-catching for years to come. When it comes down to it, decorating your bathroom does not have to break your bank. You can find some excellent all in one accessory sets that will complete the look you are going for in your bathroom. If vintage is the style you are going for, then you are sure to love the Miss Bella 5 Piece Ceramic Red Rose accessory set. 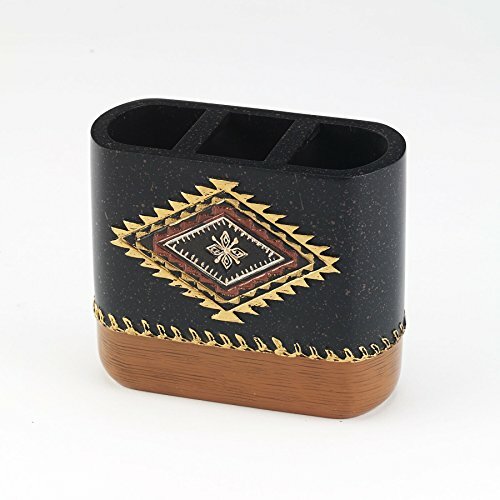 It looks great with its vintage floral design, and it is also made to last with durable ceramic. Whether you choose this one or one of the others, we are sure that it will make your bathroom really have that vintage touch.